Have you ever worked with a designer and thought ‘this person just doesn’t get it!’ or ‘what am I paying them for?’ Creativity is dependent on collaboration, and when crystal clear communication is present, amazing things can happen. Don’t be vague with your feedback. Phrases such as, “it doesn’t pop” may mean something completely different from person to person. Are you referring to brighter colors, bigger fonts, more imagery… Be specific. It will help you get exactly what you are looking for. There’s a major difference between voicing your opinion and telling your designer exactly what to do. Your designer is a subject-matter expert. They are trained problem solvers. Let them know your issues or concerns. Good designers will come up with the perfect solutions for you. If you’re not a designer, sometimes it can be difficult to convey your opinions and thoughts to your designer. In this case, finding visual examples will help bridge that communication gap and avoid miscommunication and unnecessary work. Positive feedback gives your designer concrete examples of what is working so they can continue to move in the right direction. This actually makes it easier to address the negative feedback. When asked for feedback, people generally tend to focus on the negatives because design is looked at as a chance to make corrections. Positive feedback is JUST as important. When it comes to design, there aren’t stupid questions. Ask any question that comes to mind when reviewing a design or getting started. This creates a dialogue rather than a list of changes and allows the opportunity for more creative solutions to evolve. Try to put your personal tastes aside. When reviewing a design, it’s easy to get caught up in your own personal likes and dislikes, but it’s important to remember your business and audience. A successful design should cater to and work for the end user or audience – not so much your personal tastes. 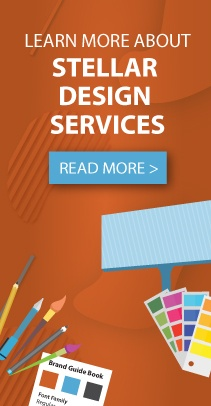 If you are considering a website redesign, our team of talented designers is eager to help! Contact Stellar Blue today!